One Last Jam! | Food It Yourself! 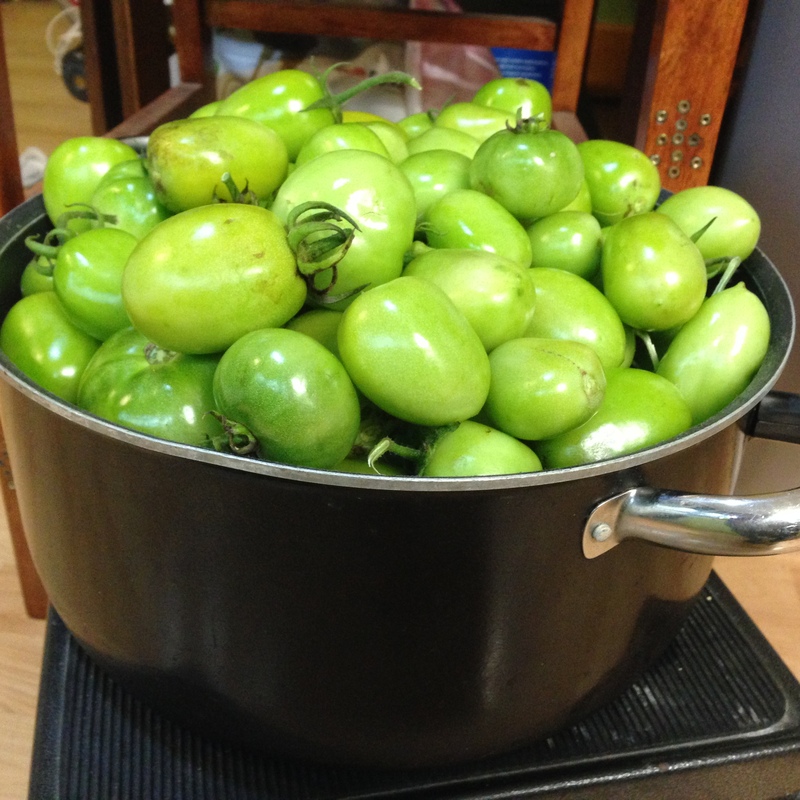 I had so many green tomatoes, I just could not toss them out. As promised, here is the story about what happened to the very hard, very green tomatoes I harvested when disassembling the 2017 Food It Yourself garden. It started, as most things do in the 21st century, with an on-line search for what to do with really, really, unripe tomatoes. 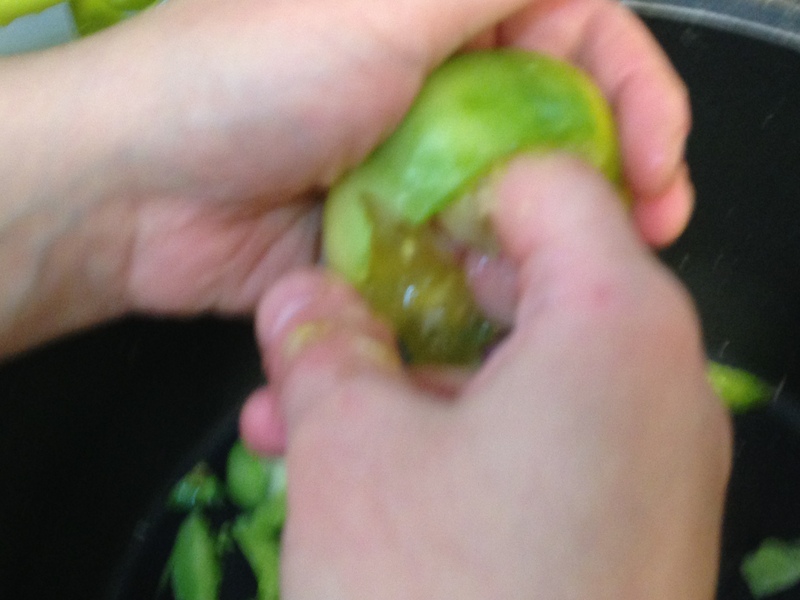 I learned by this method that green tomato jam is a thing. 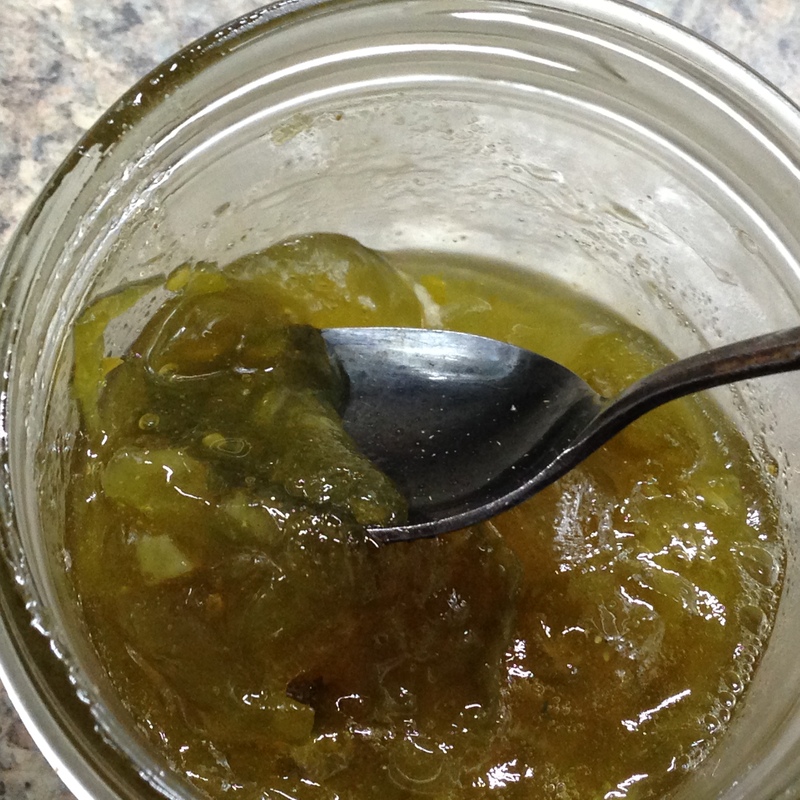 (As are green tomato jelly, green tomato marmalade, green tomato conserve…) Some recipes for it are savory, like this one from viewer-supported PBS. Some get sneaky and masquerade as other types of preserves, like this version from AllRecipes. 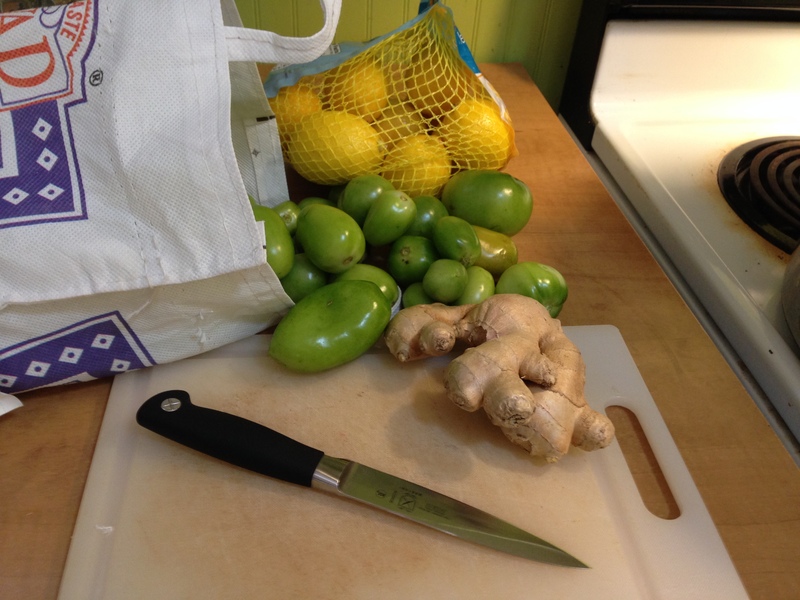 I finally decided on this lemon and ginger infused recipe from Hudson Magazine. 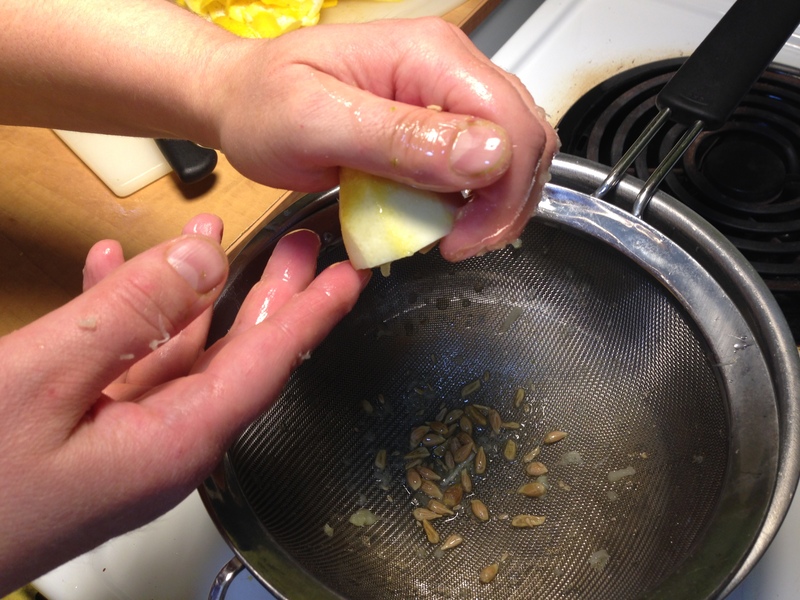 Not only is the recipe written for canning but it requires no pectin. I have never made jam or jelly without pectin, so this will be a learning experience. I know what you are thinking, “How will the marmalade set without branchy pectin molecules trapping all the liquid in a carbohydrate matrix?” The answer is, not surprisingly, another carbohydrate. Specifically, we will add lots of sucrose (aka “table sugar”). We will suspend the marmalade ingredients in a thick sugar syrup. The old school way to monitor this thickening process was to place a sample of the jam/jelly/marmalade on a chilled plate and check the consistency when it was cooled. 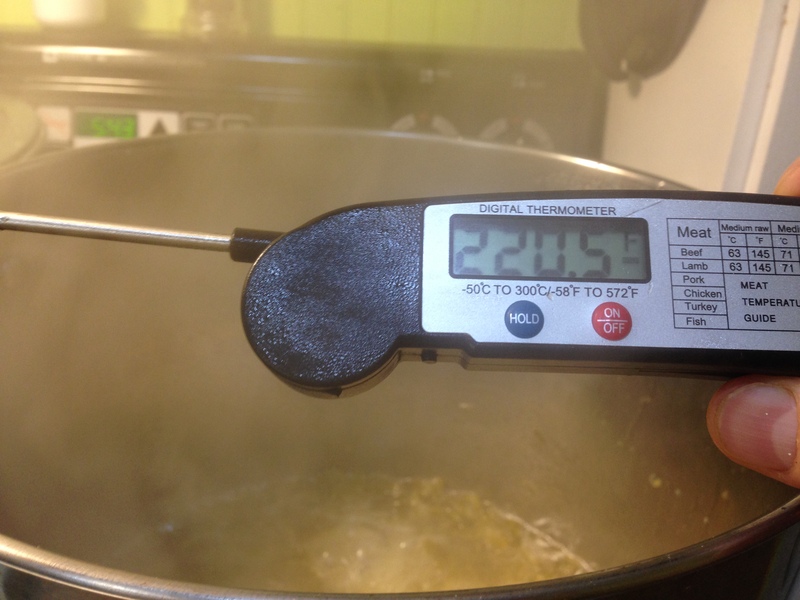 Thankfully, the recipe I chose gives a much more precise method by instructing us to cook the mixture at a boil to 220˚F. As the sugar gets more concentrated the boiling point will rise. 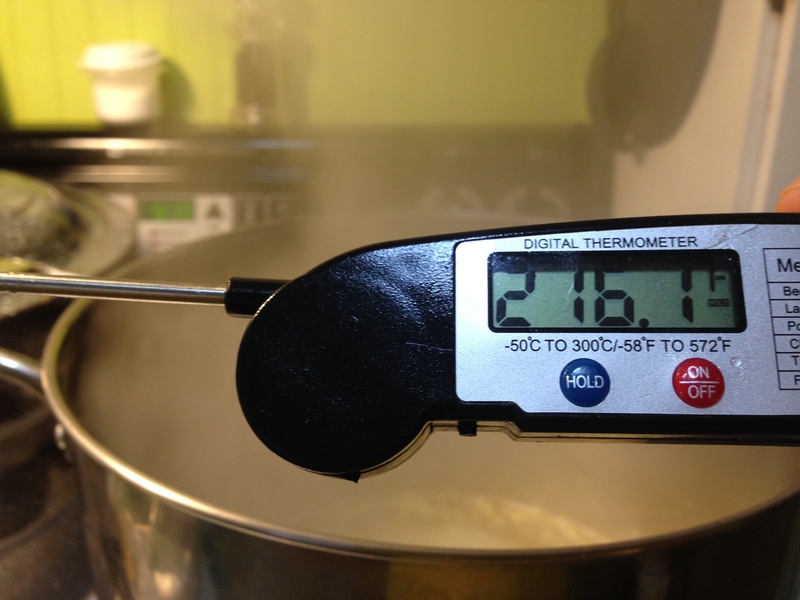 Once we hit our 220˚F mark the sugar concentration will be perfect for our marmalade. At least, that is the idea. This sugar cooking method might sound familiar if you read my post on candy making; the same principle is at work here. Here’s how it all turned out. It took a while to get all the tomatoes chopped. The closer-to-ripe ones needed their seeds removed. Most were so hard and green they had not developed seeds yet so I just chopped them small. No need to shell out cash for one of those fancy citrus zesting rasp thingies. 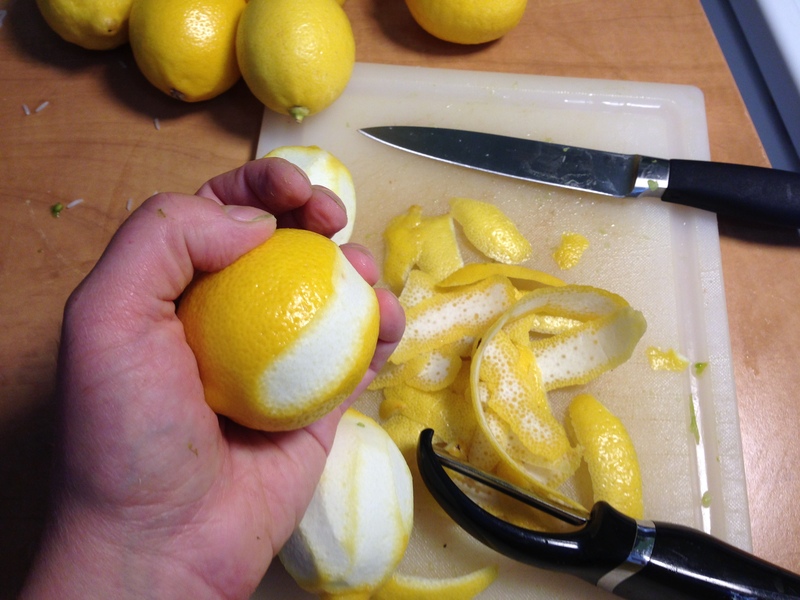 With a good peeler you can strip off the zest with little to no white pith attached, then slice the zest with a sharp knife. Enjoy that lemony scent. The easiest way to juice a lemon? Roll on the counter top to break it up inside. Slice and squish the cut fruit over a strainer. No gadgets needed, no seeds to pick out of the juice- I call that easy. A few minutes of bubbling away and the mix is already above the boiling point of plain water. It really is important to stir the kettle often. Sugar burns quickly. Burnt sugar tastes bad. We made it! Now on to filling and processing the jars. The marmalade set up just fine. And look at that color! This stuff is really good. I was worried the ginger would be overwhelming but the flavor is perfectly balanced. It is very sweet, but the tart lemon and slightly bitter tomato flavor prevent it from being over-the-top cloying. It looked a little runny when it first came out of the canner, but after 24 hours of cooling it did set to the right consistency. I love squeezing every last bite out of my garden. For me, it is part of the challenge of growing my own food. If you are lucky enough to have some green tomatoes at the end of your garden I fully encourage you to find a way to make them edible. Give it a try! What is your favorite “use-every-last-bit” recipe? Share in the comments.